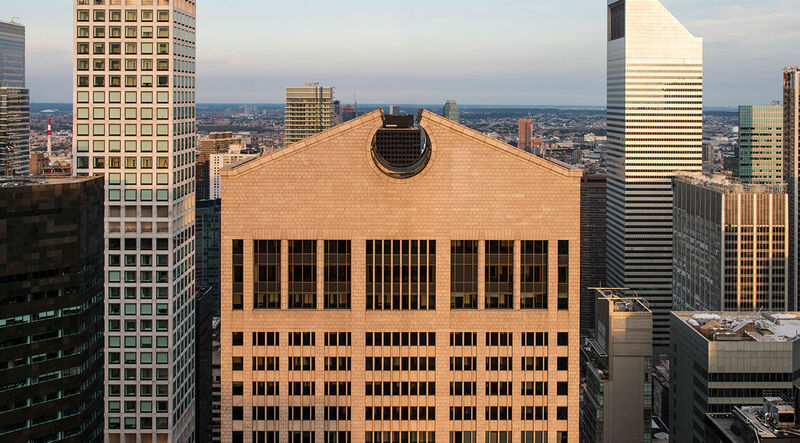 Last night Manhattan Community Board 5’s (CB5) Landmarks Committee unanimously approved a resolution in support of protecting the AT&T Building, Philip Johnson and John Burgee’s 1984 postmodern tower on Madison Avenue. Although the objective was primarily to discuss building’s historic merit and landmark eligibility, the committee’s wide-ranging conversation returned repeatedly to the owner’s decision to sledgehammer the building’s lobby in the midst of talks with preservation groups, CB5, and other stakeholders. Much of the lobby talk focused on what constitutes interior or exterior space in a young-ish building whose public areas were cocooned by a major renovation less than a decade after it opened. In 1993, Sony Corporation, the building’s new tenant, tapped Gwathmey Siegel (now Gwathmey Siegel Kaufman) to glass in a rear arcade as well as the loggias on either side of the Madison Avenue entrance, a move that created retail from previously open, public space. Although the Landmarks Preservation Commission (LPC) has already said it will not landmark the formerly exterior, now interior spaces, this didn’t stop the Landmarks Committee from expressing its disappointment towards the agency’s decision to okay demolition permits. The committee, seated before reporters and a half-dozen members of the public, heard remarks from the project team first. David Laurie, managing director for developer Chelsfield America, read a statement to the board on behalf of his company and Olayan America, the owner of the building and Chelsfield’s partner in the redevelopment. Laurie explained his team has commissioned a public garden that will be “marginally larger” than the sculpture garden at MoMA, which is 21,400 square feet. 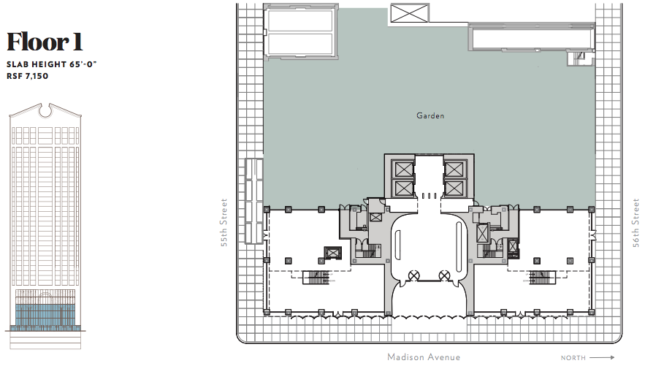 Floorplans on 550 Madison’s site give an idea of how the new spaces will flow together. The lobby, at center, remains in a similar configuration, as does the existing retail on either side. Behind that, plans show that the garden will replace an adjoining annex and the enclosed arcade between 55th and 56th streets. Despite these renovations, the lobby is—or rather, was—one of the best-preserved public postmodern interiors in New York. CB5 Landmarks Committee Chair Layla Law-Gisiko confirmed that, per permits the LPC signed off on in December, the lobby has been demolished. The Architect’s Newspaper (AN) reached out to Chelsfield America for comment on its decision to alter the lobby but had not heard back at press time. On February 1, a representative for the developer confirmed the work described in the permit—the removal of interior partitions, ceilings, elevators, and finishes—has been completed. The representative could say whether the patterned marble floor remained intact. The ground floor plans are part of Snøhetta-led renovation of the building that was unveiled in October 2017 and immediately condemned by leading architects as context-clueless and disfiguring. Among other changes, the Oslo- and New York-based firm proposed a striking exterior alteration of the structure’s monumental Madison Avenue facade that would have swapped the rosy Stony Creek granite, a contextual reference to the city’s classic Beaux-Arts skyscrapers, for an undulating glass curtain wall. The outcry over the design prompted preservationist Thomas Collins to initiate the building’s landmarking, which usually (though not always) stops the clock on major renovations. The LPC subsequently added the structure to its calendar for landmark consideration last November. Over objections from Collins and others, however, the LPC is only considering 550 Madison’s facade and public spaces, not the lobby, for landmarking. Four members of the public spoke in support of landmarking. These included Collins, a representative of civic group the Municipal Art Society, and Liz Waytkus, the executive director of modern architecture preservation group Docomomo US. “The historic nature of AT&T is one whole design,” Waytkus said. She decried what she characterized as “backroom lobbying” that led to the LPC’s approval of lobby demolition permits. The full board will vote on the Landmarks Committee’s resolution at its meeting this Thursday. Although community board resolutions do not carry the weight of law, the LPC takes their decisions into account during its own deliberations. This post has been updated with new information about the state of the lobby.